Try this sweet and juicy recipe at your next family barbecue. Fruit that is firm can be used in most baked or grilled recipes. Makes 8 servings. ½ piece fruit per serving. 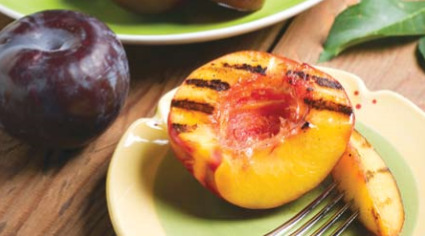 Cook 4 halved peaches, plums, and/or nectarines over medium, indirect heat for 8 minutes in a covered barbecue grill. Turn after 4 minutes. Serve while hot.